EVC International NV (Amsterdam, The Netherlands) and Bechtel Group, Inc. (San Francisco, CA), have signed a technology alliance to market and build VCM plants based on ethane rather than ethylene feedstock. The companies have run a 1000 tonne/y pilot plant at Wilhelmshaven, Germany, since May 1998. Although EVC says some aspects of the technology remain unproven, the companies plan to begin design work on a full-scale plant they expect to bring on line in 2003. EVC's patented ethane-to-VCM process represents a potential breakthrough in VCM production technology and economics. 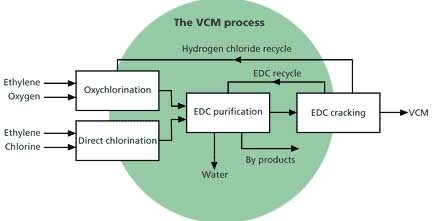 Virtually all modern VCM plants chlorinate ethylene to form ethylene dichloride (EDC), which they upgrade to VCM. EVC's one-step route directly chlorinates ethane to make VCM, bypassing the ethylene cracker and eliminating EDC production. The impact on economics could prove massive. Ethane costs only about one-third as much as ethylene. Ordinarily, VCM and PVC prices are move with those of ethylene as well as polyethylene, the largest ethylene-based resin. The new process decouples VCM costs from these components of the ethylene chain. EVC and Bechtel will market and build new VCM plants that bypass conventional production routes (above) to produce VCM directly from chlorine and ethane. The process has the potential to put a significant dent in capital costs, since it eliminates ethylene crackers and EDC reactors from the PVC chain. Producers, however, will not blithely build new VCM plants anywhere they find an ethane stream. EVC's ethane-to-VCM process still requires chlorine. Not only is chlorine extremely dangerous to handle, it is highly energy-intensive as well. As recently as the late 1970s, chlorine production consumed more than 1% of total US electrical power. Rather than build electrical generation capacity for chlorine, many developing countries prefer to import safer chlorine-containing chemicals from regions with a well-developed chlorine chemical infrastructure. For the past two decades, the US, Europe, and Japan have shipped huge volumes of EDC and VCM to Asia and other developing areas. EVC is not the first company to attempt to produce VCM from ethane. Several attempts failed during scaleup, stymied by a combination of poor conversions, catalyst instability, and corrosion caused by high reaction temperatures. Many of these problems disappear in EVC's process, which operates at less than 500 C. Its relatively low temperatures reduce corrosion and extend catalyst life. The process also uses a novel catalyst and recycle design to maximize ethane conversion and minimize byproducts. Inovyl, EVC's technology licensing operation, has run the Wilhelmshaven plan for more than one year to confirm process viability. According to the company, raw materials conversions run 100% chlorine, 99% oxygen, and more than 90% ethane. Conversion to VCM is greater than 90%. The company reports excellent catalyst life and no sign of corrosion problems. According to Inovyl business manager John Holton, Bechtel was the "obvious choice" for an alliance partner. Bechtel has broad VCM design and construction experience, and has participated in nine successful vinyls projects using EVC technology. "Putting our expertise together," says Holton, "we can develop the process optimization and industrial plant design in parallel, keeping the project on track to meet our target to construct the first industrial plant by 2003." In 1998, Bechtel's 40,000 employees booked $13.3 billion in new work while achieving revenues of $12.6 billion. Over the past 30 years, its design, engineering, and construction projects have embraced virtually every process technology used by the chemical and petrochemical industry. EVC counts itself as Europe's largest (and the world's fifth largest) PVC producer with 1.3 million tonnes/y capacity at eight plants in Germany, Italy, and the United Kingdom. It converts about 20% of its resin into value-added products, include compounds, rigid films, and foils. It also manufacturers 1.3 million tonnes/y VCM as well as EDC. Building on early Stauffer processes, EVC's Inovyl technology arm has developed a family of EDC, VCM, and PVC processes. More than one-third of the world's capacity uses EVC's EDC and VCM technologies (and more than half the world's new oxychlorination EDC capacity). Inovyl recently launched a new single-stage, fixed bed oxychlorination process that improves EDC production efficiency while lowering capital costs by 20%. EVC uses the technology in its Runcorn, UK, VCM plant. The company also licenses a number of suspension, emulsion, and microsuspension PVC process. It also produces fixed and fluidized bed oxychlorination catalysts and PVC polymerization additives. For more information: John Holton, Business Manager, Inovyl, Blvd. du Souverain 360, B-1160 Brussels, Belgium. Phone: 32-2-674-78-80. Fax: 32-2-674-78-81. Email: licensing@inovyl.com. Or: Bechtel Group, Inc., 50 Beale St., San Francisco, CA 94105. Phone: 415-768-1234. Fax: 415-768-9038.